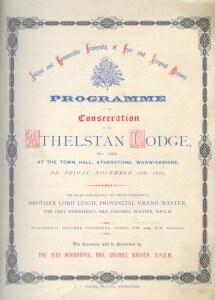 Freemasonry came to Atherstone on Friday, 18 November 1870. The consecrating Officer was Very Worshipful Brother Colonel Machen, the Deputy Provincial Grand Master at the time. The first Master of the Athelstan Lodge was Worshipful Brother Frederick Cohen. Nearly 150 years later, the Lodge is stronger than ever. It is dedicated not only to the tenets of Freemasonry, but to supporting charity in general and local charities in particular. Details of our efforts can be found elsewhere on this site. Athelstan 1333 is one of the 142 Lodges that comprise The Provincial Grand Lodge of Warwickshire. Athelstan Lodge is also one of the more than 7,000 Lodges affiliated to the United Grand Lodge of England. UGLE, with over 200,000 members, is the governing body of Freemasonry in England, Wales and the Channel Islands.